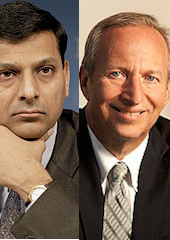 How does Larry Summers, would-be Fed Chair, measure up to India’s new central banker, Raghu Rajan? In contrast to Rajan, Summers has excelled almost exclusively as a propeller and enabler of vested interests. What a difference in the reaction to two candidates slated to take over a key country’s central bank. When Raghu Rajan was appointed to become the new head of the Reserve Bank of India, the verdict was near-universal: an extremely qualified person had been selected for the post. The biggest concern was, and is, whether — given India’s challenges — the tasks ahead are too big for anyone to shoulder successfully. At the core, though, everybody readily agreed that Rajan is a man with a proven track record when it comes to a central banker’s most important virtue, the willingness to speak truth to power. Rajan demonstrated that ability most prominently a few years back when he singled out the lack of stability of the U.S. financial system, a call highly unpopular with U.S. elites at the time, although entirely on target. His presumed U.S. counterpart, Larry Summers, hasn’t gotten the official nod yet, although he has received a lot of presidential blessing as the right man for the job. And yet, I wonder. Sure, Summers as an economist is as brilliant as Rajan. Both were star professors in the U.S. economics scene. But in complete contrast to Rajan, Summers has excelled almost exclusively as a propeller and enabler of vested interests. His specialty is not speaking truth to those in power, but rather most agilely further empowering those in power.